The Western Digital My Cloud DL4100 NAS is incredible. It's easy to set up, transport and look at. A work of art. As someone who works in technology and does a ton of work at home, I always perform backups on my computers. I have external drives, I have internal RAIDs, and I have cloud backups, but they always require manual setup. I live in a world where everything seems to be automated and finding a way to simplify backup and transfer processes is a must. 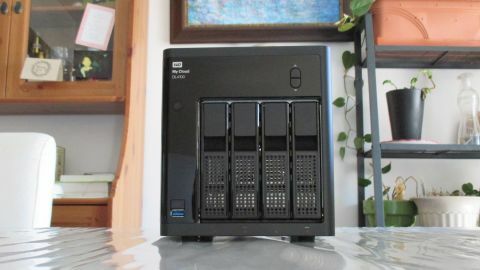 Well, there is a solution - enter the Western Digital My Cloud DL4100 Network Attached Storage (NAS), which offers the options and features required to fit the needs of many small businesses, web developers, freelancers, photographers, and even some medium-sized businesses. The DL4100 comes in several different formats. It comes in a standard diskless model ($529.99, £499, AU$689.52), an 8TB model ($849.99, £799, AU$1105.57), a 16TB model ($1,169.99, £1099, AU$1522.17), and a behemoth 24TB model ($1,529.99, £1419, AU$1990.53). The price might be high, but if you're running a business at home, a small start-up, or if you're a freelancer, then all of your data is critical, and you will want an easy-to-use, reliable backup solution. The DL4100 is an investment that is definitely worth making. The Western Digital My Cloud DL4100 NAS is pretty heavy at 14.03 lbs (6.36 kg). The dimensions of the DL4100 are 5.82 inches (147.8 mm) in height, by 8.51 inches (216.1 mm) deep, and 4.28 inches (108.6 mm) wide. The DL4100 is no taller or wider than a mini desktop and I found that hiding it near my cable modem was easy to do. The NAS supports up to four drives with four drive bays. You can also buy a diskless model and provide your own hard drives or purchase different models that come with the drives. I received the 8TB model with RAID-1 configuration drives that are combined as one volume for redundancy. RAID-1 configuration means that you have one volume on two hard drives, which enables the hard drives to replicate. This is a neat feature because if one hard drive fails, your data is still saved. You can configure this NAS in a RAID-0 (striped, where data is split on two drives so that it reads the data faster but without redundancy), RAID-5 and RAID-10, but more on that later. The DL4100 has a lot of cool features, such as a web-based panel where you can set users, shares, permissions, RAID types, and backups. More importantly, the web-based panel features integrated web-apps to back up with cloud services (such as AWS) or integrate with Dropbox or Box. The Western Digital My Cloud DL4100 NAS has two gigabit ethernet ports, three USB 3.0 Ports, one USB 2.0 Port, and two AC/Adapter connections for redundancy. This is a really sweet feature that allows you to be able to connect this to separate power sources as well as network sources. While this might not be applicable in a home-office setting, it is something that is useful for those who rely on very reliable backups. This feature ensures the DL4100 will always be powered on and is seemingly fault tolerant, meaning it won't fail if, say, a switch or a power cable were to break. There is an LCD screen on the front panel of the device that tells you the IP address, status of the RAID, hard drives, and other important basic information. What I also like are the LEDs under each individual drive bay that will glow orange if there is a problem. The Western Digital My Cloud DL4100 NAS is powered by an Intel Atom 1.7 GHz C2337 dual-core processor and comes with 2GB DDR3 memory stock. You can upgrade the NAS to use 6GB DDR3 Ram to improve system performance if needed.